We were pretty lucky to get a reservation at The French Laundry. Our going there wasn’t by plan, but we knew we would be in Napa Valley and thought it worth trying to get in. Reservations are made two months to the day and we happened to call on June 30th, the last day of the month; thus, doubling our chances by allowing us to book August 30th or 31st. With reservation in hand, we really wanted to make the most of the experience. We booked a hotel a block away (so as not to concern ourselves with driving). We had a camera, but had no intention of taking pictures of the food. We wanted to enjoy the meal, supposing, as Thomas Keller would have wanted us to. In short, it was really good and really hot. It’s hard to deny the beads of perspiration shown in the pictures. Yes, it was rather warm in the dining room and the very apologetic head waiter explained that the the new geothermal A/C system wasn’t quite up to snuff. Normally men are expected to wear a jacket, but that rule was officially not in effect. Doug decided to tough it out, operating under the philosophy that there are too few times in modern society that one must stand on ceremony. We were seated promptly in the upstairs dining room and given menus that included a la carte and pre fixe tasting menus, both vegetarian and non-vegetarian. The tasting menus also having several optional items at additional charge. We decided to go non-veg with all the options. There has been a lot written about food at The French Laundry, but the thing that really stood out was the service. It is like no other restaurant. The servers move silently. They glide in, put down plates, describe the dish, and then disappear. After you are done with the course, the head waiter comes in and chats. If you have questions, he answers them. The setting is cleared and the process repeats. We must have been under surveillance because they never approached unless it was the right time. Sometimes we missed seeing the table get cleared. Several waitstaff would swoop in and move though the dining room like ghosts. No chatter. No bumping into one another. No clanging of glassware. It was as if it were all rehearsed, and probably was. When we did notice the waitstaff, we felt a little bad for them. It was clear that they had to truck downstairs to get the food then make themselves presentable in the heat before entering the room. Presumably there was someone with a towel on the other side of the doorway, because they would enter dry then gradually start to bead with sweat before whisking themselves away. The food was a good as people say it is. Each course is light, flavorful, and creative. Some of the presentations are playful, like the well established salmon tartar ice cream cone amuse bouche. Some were just the only way food should be made, like the butter poached lobster. The ingredients are either local (like from across the street) or sourced from a specialty farm. Ruth was especially impressed with the choice of butter from France or Vermont. 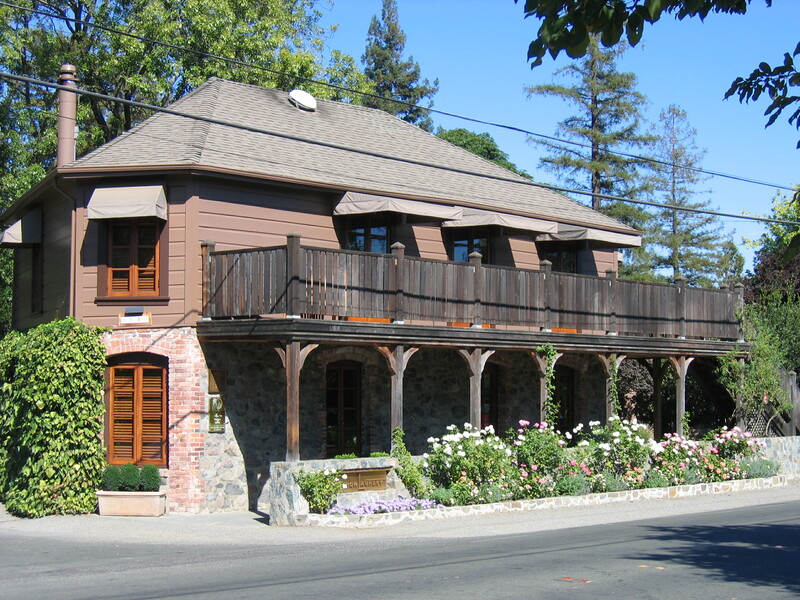 The French Laundry is a tourist attraction in a manner of speaking. Not that it is tacky like some roadside wonder, but everyone there seemed to have traveled some distance just to eat there. The table of Australians next to us had made a much more significant effort than we had to get there. Then there was the young couple diligently photographing every course as so many have done. The head waiter divulged that there are few regulars. It’s just too hard to get into. If we could afford it, we would go back. It would be great to try out the a la carte menu. Chances are we will not go back if only because there are so many good restaurants in Napa Valley. For any given price point, every restaurant we ate in was as good or better than Boston restaurants. The wine selection was always better. Posted in Restaurants and tagged Michelin three star, Napa Valley, tasting menu, Yountville on August 31, 2007 by Doug.